WHEN GOOGLE FIRST announced Google Lens last year, it was described as a kind of search in reverse. Rather than type a text query to find image results, you could point your phone’s camera at an object, like a dog or a plant, to find text-based information. Lens was not only a statement about your camera as an input device but also a most Google-y expression of technology: It combined search, computer vision, AI, and AR, and put it all in apps that weren’t limited to one ecosystem. 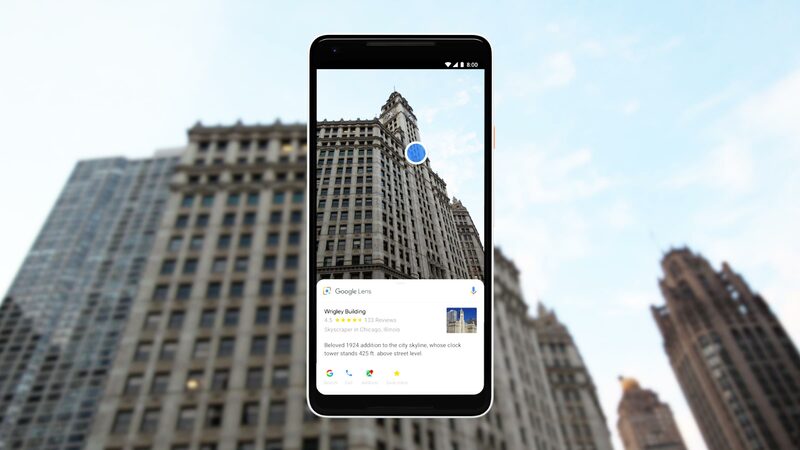 At this year’s developers conference, Google announced the most significant update yet to Google Lens—one that emphasizes shopping, text-reading, and additional language support. And to make Lens more convenient for people to use, Google has convinced a bunch of handset partners to offer Lens as an option right in the native camera app. In other words, Google’s vision of the future still involves searching for things. Now it’s just by whipping out your phone and pointing the camera at something, a behavior that’s become second nature to smartphone users. But Google knows it’s not the only tech company working on visual search, so it’s trying to wedge Lens into places you’re already active on your phone. Earlier versions of Lens could be accessed through Google Assistant and Google Photos; the new version will be built directly into the camera on more than ten different Android phones. This includes Google’s Pixel phones; handsets from Asus, Motorola, Xiaomi, and OnePlus; the new LG G7 ThinQ; and more. On the G7 ThinQ, Lens will also have a physical button—press it twice and the Lens camera automatically opens—the same way that Bixby has a dedicated button on Samsung flagship phones. In a demo of the new features, launching Lens with a physical button worked like it was supposed to on the LG G7 ThingQ. On phones without a dedicated Lens button, Lens appears as one of the main options in the camera app, the same way that video recording does. Another thing that’s new about Lens: The camera app starts scanning the space around you as soon as you open it. “We realized that you don’t always know exactly the thing you want to get the answer on,” says Clay Bavor, Google’s vice president of virtual and augmented reality. “So instead of having Lens work where you have to take a photo to get an answer, we’re using Lens Real-Time, where you hold up your phone and Lens starts looking at the scene [then].” This scanning function appears as a series of AR dots, mapping the world around you, before a virtual button appears as a ready-to-go signal. Both native camera access and the Lens Real-Time feature contribute to a faster visual search experience, but the latter also mean Lens grabs information you may not need it to. In one instance, I pointed the new Lens at a pair of shoes only to get search results for the restaurant Nopalito, because the restaurant’s menu was sitting on a shelf below the shoes and Lens had picked up on it as I raised the camera. It also wasn’t 100 percent accurate when it came to shopping, one of the other key features of the new Lens. At one point, Lens identified a large gray sweater as an elephant. But the version of the app I saw was still in beta, and Google says the misidentification will be fixed by the time it rolls out at the end of the month. And in general, the shopping results were impressive. An earlier version of Lens might simply identify the object as a sweater, or a pillow, or a pair of shoes. The new Lens has something Google calls “Style Match”: It found a match for all three items, showed options for where to buy them, and recommended similar items. It even knew the pillow I brought with me for the demo was from Etsy.com. If the first version of Lens was about pets and plants, this version might be defined by clothes and home decor. The new Google Lens will also support Spanish, Portuguese, French, German, and Italian—which, it’s worth noting, is different from translation. Lens has always been able to translate languages supported by Google Translate. This update just means if you’re a native speaker in one of those new languages, you can run a version of Lens that’s specific to that language. “We’ve always used vision technology in our image recognition algorithms, but in a very measured way,” she says. It’s a problem that many others are trying to tackle as well. Facebook, Amazon, and Apple have begun been building their own visual search platforms or acquiring technology companies that analyze photo content. Last February, Pinterest launched its own Lens tool, which lets users search the site using the Pinterest camera. Pinterest Lens also happens to power Samsung’s Bixby Vision. There are smaller competitors too: The AR app platform Blippar can recognize flowers, public faces, and famous landmarks through a smartphone’s camera. Even high schoolers are building “smart lens” apps.